Zhang, X., N. P. Myhrvold, Z. Hausfather, and K. Caldeira, Climate benefits of natural gas as a bridge fuel and potential delay of near-zero energy systems. Applied Energy, doi:10.1016/j.apenergy.2015.10.016. Natural gas has been suggested as a “bridge fuel” in the transition from coal to a near-zero emission energy system. However, the expansion of natural gas risks a delay in the introduction of near-zero emission energy systems, possibly offsetting the potential climate benefits of a gas-for-coal substitution. We use a schematic climate model to estimate CO2 and CH4 emissions from integrated energy systems and the resulting changes in global warming over various timeframes. Then we evaluate conditions under which delayed deployment of near-zero emission systems would result in loss of all net climate benefit (if any) from using natural gas as a bridge. Considering only physical climate system effects, we find that there is potential for delays in deployment of near-zero-emission technologies to offset all climate benefits from replacing coal energy systems with natural gas energy systems, especially if natural gas leakage is high, the natural gas energy system is inefficient, and the climate change metric emphasizes decadal time scale changes. Figure 1.Concept diagram for transitions from coal energy system to near-zero emission energy systems. 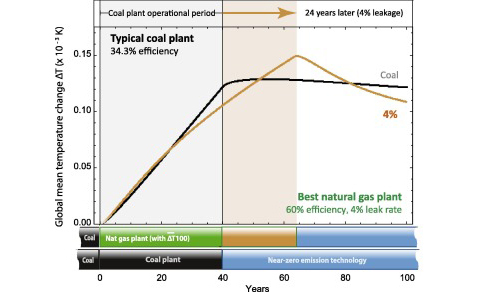 For simplicity, we focus on a reference coal energy system with an additional N-years of operating life (N is 40 in this study), and a natural gas energy system that is either retired DH years earlier than the reference period, or DL years later than the reference period. After these operational periods, we assume these energy systems are replaced by an idealized near-zero-emission energy system. In our work, depending on the specific characteristics of the natural gas and coal energy systems, and the climate metric chosen, we find the values for DH or DL that would cause the natural gas system to be no better or worse than the coal system (the “breakeven” time). DL would then represent the maximum delay that could occur in the deployment of near-zero emission technology without losing all benefit from the use of natural gas. Figure 2.Global mean warming from the most efficient natural gas and the most efficient and world typical efficiency coal energy systems operating at 1 GWe. We show the breakeven operational period of natural gas energy systems using , the average temperature change over the 100 year period. The natural gas energy system operating for 64 years, with a 4% natural gas leakage rate (Zhang et al. ), produces the same amount of warming averaged over the century as the coal energy system operating for 40 years. This indicates that, using this metric in this example, the transition to natural gas energy system could delay introduction of near-zero emission energy systems by 24 years without losing all of the climate benefits of shifting from coal to natural gas energy system.